2014 has thus far provided us with the backdrop to several drama's but for me it has been the source of major frustration. 2014 marks a point in Formula One that not only see's the largest rule change in the sports history but hinges on a major technological leap forward. Unfortunately I'm left aghast at the poor coverage supplied by the UK broadcasters (at least) which not only borders on propaganda/misinformation but moreover shows their disinterest in covering what makes the sport tick. The latest signal of this was the Skysports feature over the Bahrain GP weekend claiming an exclusive as to why Mercedes were so fast compared to their rivals. The piece although great from the perspective they were actually covering the technical side of the sport was good, however their claim on an 'Exclusive' is somewhat incorrect. Myself, @ScarbsF1, @RacecarEngineering amongst others have all talked about this in the past via Twitter (albeit with the exception of Racecar Engineering who actually published it in their magazine on 5th March). Furthermore pretty much anyone who looked over the regs ahead of 2014 would have realised that splitting the turbo and installing the MGU-H between it in the V was a great way to package it. I even drew it way back in 2011/12 and published it in January 2013 when I took a look at the PU's and packaging on the blog. The insinuation that the works team are the only ones that could fully utilise the advantages of this turbo layout however are unfounded. I actually corrected misinformation that Crofty gave via twitter during his '#AskCrofty' after the Bahrain GP. @SkySportsF1 @richardh105 incorrect the turbo is a homologated component and so all Merc teams have the same Turbo / MGU-H installation.. 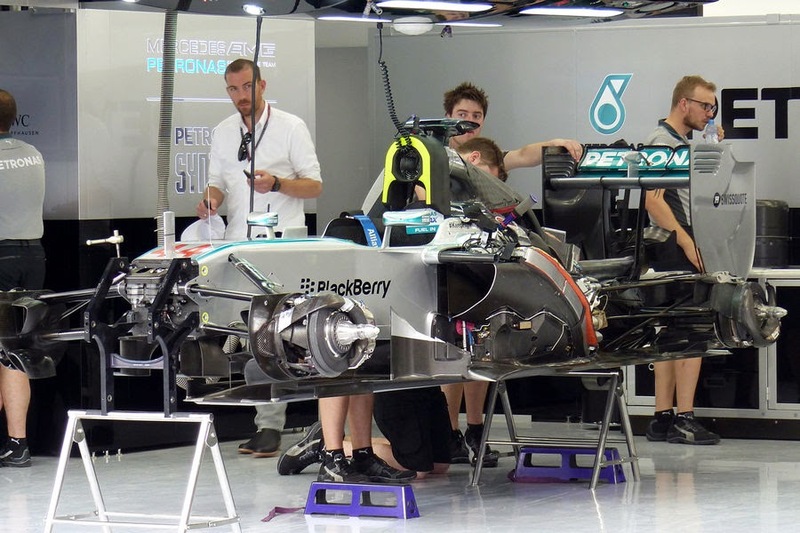 The Homologation process covers the ICE, Turbo, MGU-H and MGU-K meaning that the split arrangement is run by ALL Mercedes powered teams. Don't get me wrong, the advantages gleaned by Mercedes (works team) are reliant on the split turbo configuration but it's how it's been used to package other items that stands them apart from McLaren, Force India and Williams. I won't go on to tear down the rest of the Sky package but suffice to say there are other technical elements that are incorrectly displayed during the presentation. So what are the differences between the teams? Twin engine radiators (smaller than their usual capacity due to the downsizing of the engine) with twin air to air coolers mounted in conjunction with them, keeping the aero status quo. The downside of this is the increased level of pipework, especially the larger diameter boost pipes. 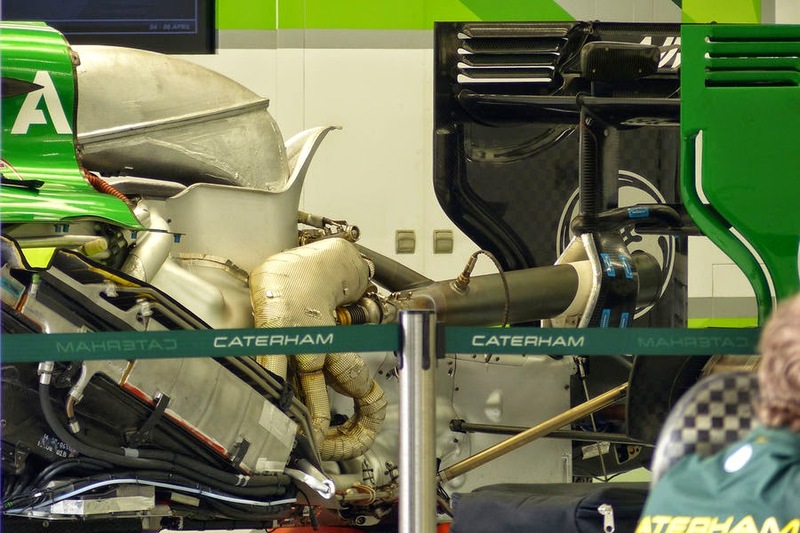 A singular engine radiator, obviously larger than the one used in the setup above mounted in one sidepod, with a singular but similarly sized air to air cooler mounted in the opposing sidepod. The issue here would be the difference in core thickness between the water filled radiator and boost filled after cooler. Symmetry would also be lost in terms of the boost pipe sizings vs the water hoses. 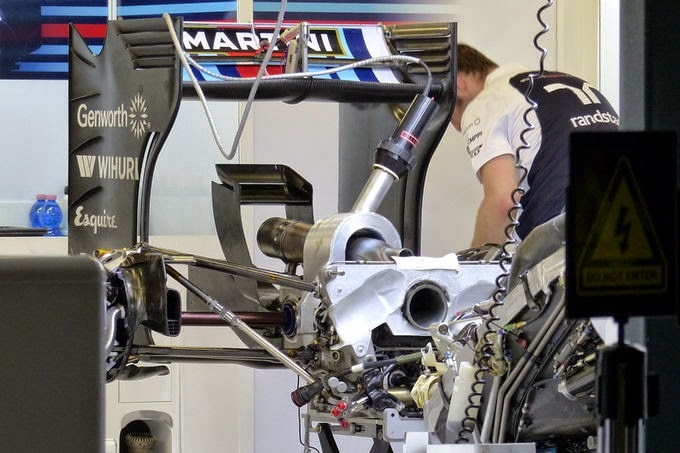 A charge cooled (air to liquid) setup would allow for similarly sized water radiators to be placed in either sidepod (one for engine cooling, the other for the chargecooler) with the water jacketed cooler placed between the turbo's compressor and the inlet. This setup has a few drawbacks which invariably outweigh the positives, the jacketed cooler's weight is placed relatively high up (increased CoG) but the shorter tract between the compressor and the inlet means you have less pressure drop (increased performance). The use of the pre-rad to support the chargecooler means that there isn't the packaging issues associated with the larger diameter boost pipes used with the air to air setups. A charge cooled (Air to liquid to air) setup with an engine radiator (smaller than the iteration above), pre rad and a chargecooler, either side of the car. The symmetry of the two sidepods points squarely at Mercedes opting to place their chargecooler in a void between the engine block and the fuel cell, giving the shortest boost tract and requiring the least space in terms of packaging for the sidepods, whilst maintaining the symmetry of the components housed within the sidepod. 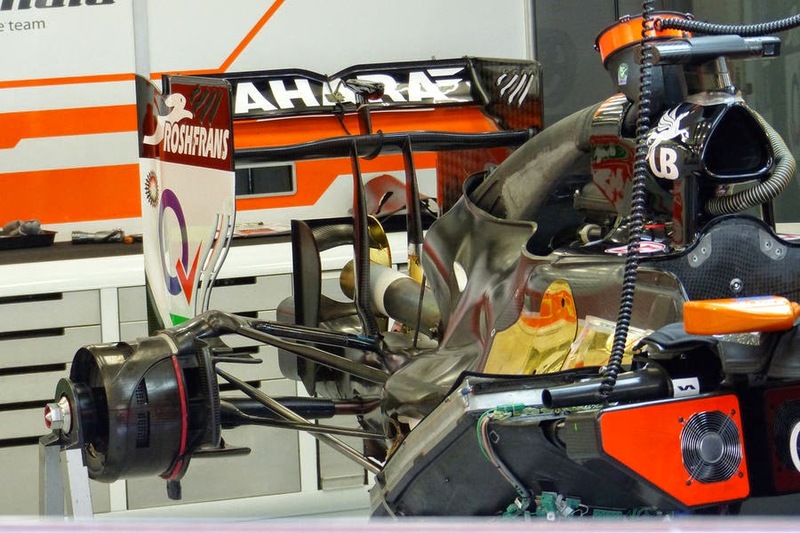 The MP4-29 has a twin stack of radiators placed in the right hand sidepod, whilst their air-to-air cooler finds a home in the left hand sidepod. The layout is a little un-conventional when compared with the last few seasons with the coolers inverted. The twin radiator layout in the right hand sidepod also leads to an elongation on that side, whilst a plethora of pipework at the front edge of the bodywork points to the team circulating the airflow around the coolers. 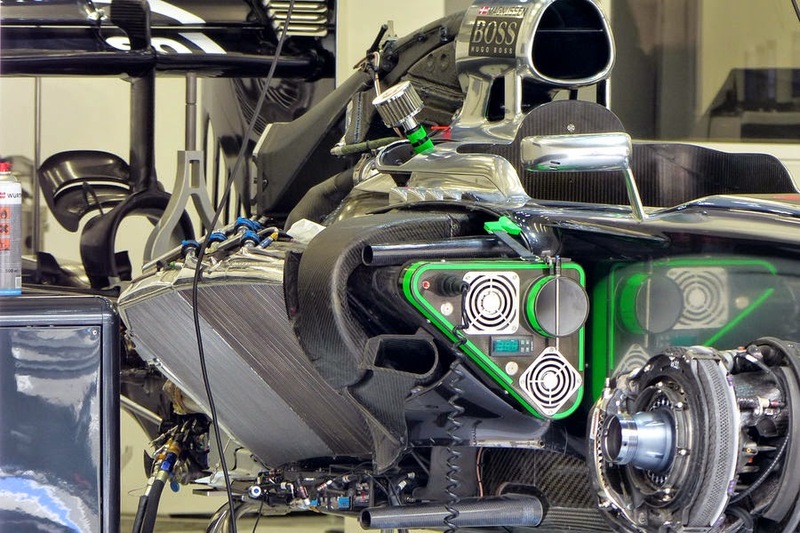 Force India's approach is perhaps the most obvious choice in terms of the air-to-air variants and from the image above we can see the effort that has been made in order to get the coolers ahead of the ICE, therefore the heat generated by the exhausts is less of a factor. 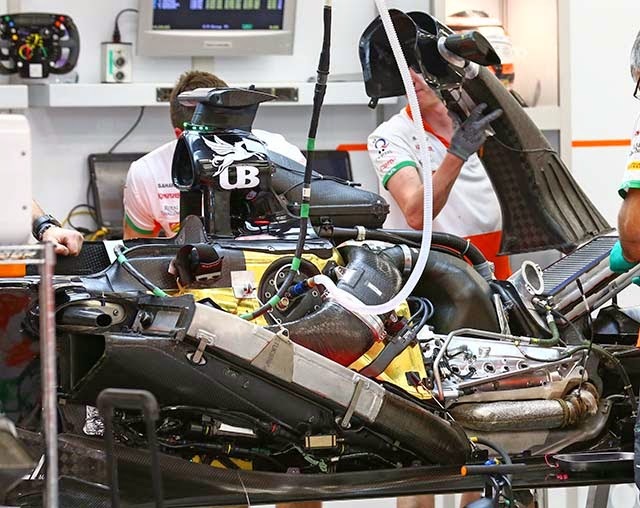 Force India have opted for the more conventional laid back coolers to maximise airflow passing over their surface. Bear in mind that the arrangement of the cooling fins have to be orientated to take this into effect too as otherwise it wouldn't be worth tilting them. Pictures of the FW36's internal packaging are a little rare, but what I can make out from the limited information is that they have gone for the conventional laid down orientation of the coolers. 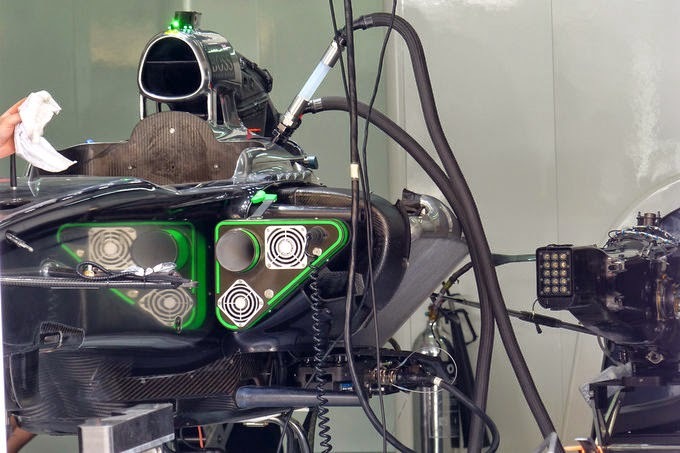 I'd also surmise that like Force India they have opted for the engine radiator in one sidepod and air-to-air cooler in the other option but I'll verify this when I have the proof. 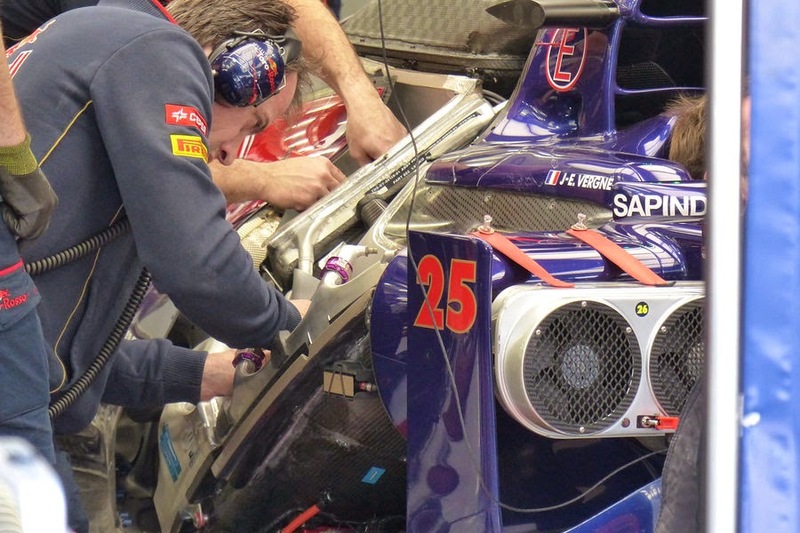 Red Bull appear to have taken the heavier solution to chargecooling, stacking both the ICE radiator and chargecooler pre radiators in each sidepod, whilst the chargecooler is mounted aft of them. 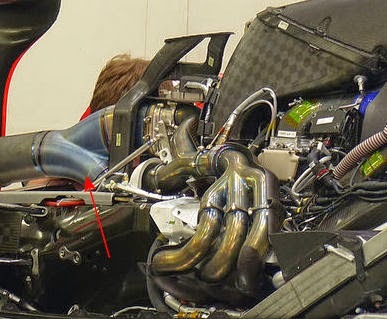 This is perhaps more pertinent given the decisions made by Renault in terms of the turbo's configuration as the boost pipework will be shorter and placed alongside the turbocharger (having not split the compressor from the turbine like Mercedes). 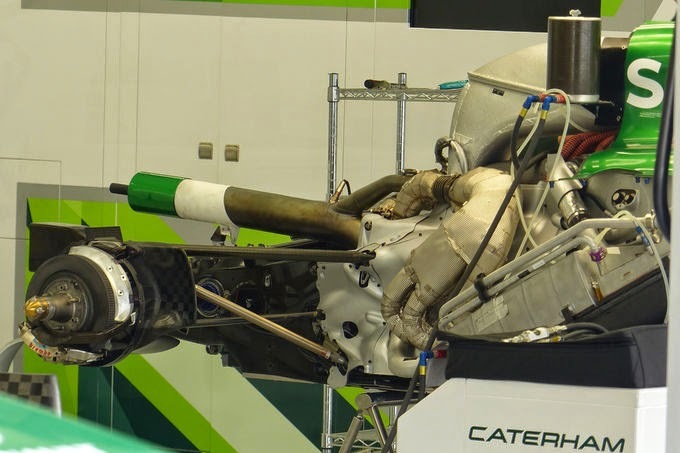 Caterham have followed a very similar path to Red Bull in terms of stacking twin ICE radiators in either sidepod with the chargecoolers pre rads, the angling of these is much sharper though in order to curtail their presence ahead of the exhaust manifold. 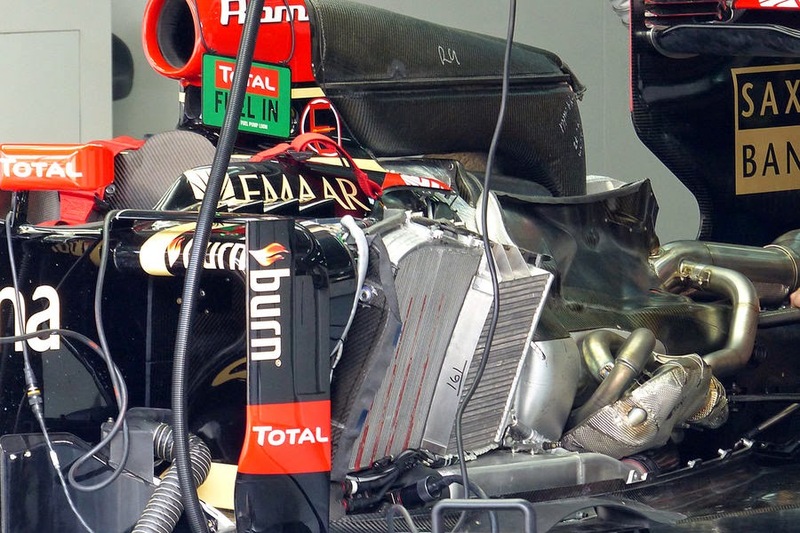 Lotus have also gone down the chargecooled route but have a different layout to the previous two Renault powered teams with the ICE radiators and chargecooler pre-rads mounted almost vertically/longitudinally with the chargecooler itself lying under the rear rad. To supplement the flow of cool air in that region the team have also utilsed a floor duct for the left hand sidepod due to the increased piping created by that exhaust (I'll explain this a little more later). I've only been able to find an exposed photo of the right hand sidepod of the STR9 thus far (and not the best angle) but I can see that the team have a double stacked radiator configuration with the chargecooler mounted aft of it. I'd suggest that the team will have mirrored the layout in the opposing sidepod. As images of the Ferrari powerunit and it's configuration aren't readily available I'll comment on the Marussia and Sauber layouts instead. However from the limited images of the F14T I have seen bare I'd conclude the team like the teams they're supplying are running a chargecooler arrangement. 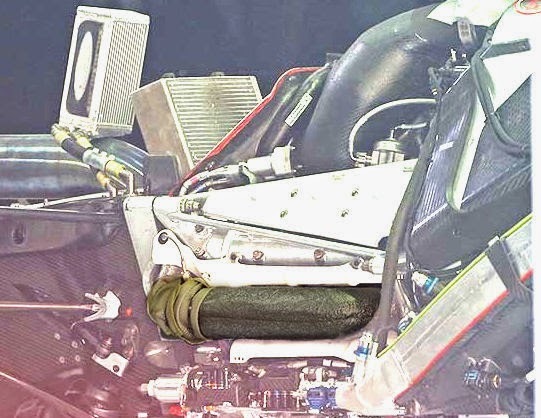 From these images I'd surmise that Marussia have opted to run a chargecooled setup with an engine radiator in one sidepod and a pre-rad in the other. This makes the Ferrari configuration closer to the Mercedes one than say the Renault one but it still holds a significant variation. Ferrari have not opted to separate the compressor and turbine and run the shaft through the engines V, however it would appear the boost pipe from the compressor is routed through there (through a donut in the airbox pipework), terminating at the chargecooler. The air is then cooled within and exits from the top into the inlets (pipework which has the green temperature stickers on it). 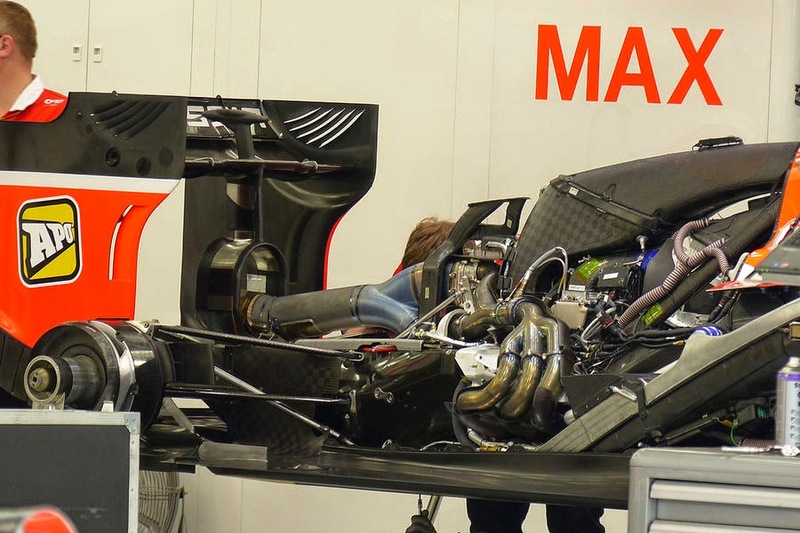 As you can see I have limited images of the C33 to work with but apart from the orientation of the radiators (in this car they are vertical) they appear to be using a chargecooled setup, the same as Marussia. This next section may involve a bit of scrolling back to the pictures I've used above rather than filling the article with yet more images. One of the other areas that can be changed by each team in order to enhance performance is the exhaust. You'll note that from all of the images presented of Mercedes powered cars the teams are utilising a log manifold rather than the equal length ones we are used to seeing. Now this is an area of performance that is a trade off and so depending on where you are wanting to make gains it would change your approach. Furthermore there are still design considerations and marginal differentials in each design that can affect both torque and power curves. Add into the mix what the MGU-H is capable of doing in terms of spooling / supporting the turbocharger, what size and/or scroll your turbo is and you have some serious decisions to make. 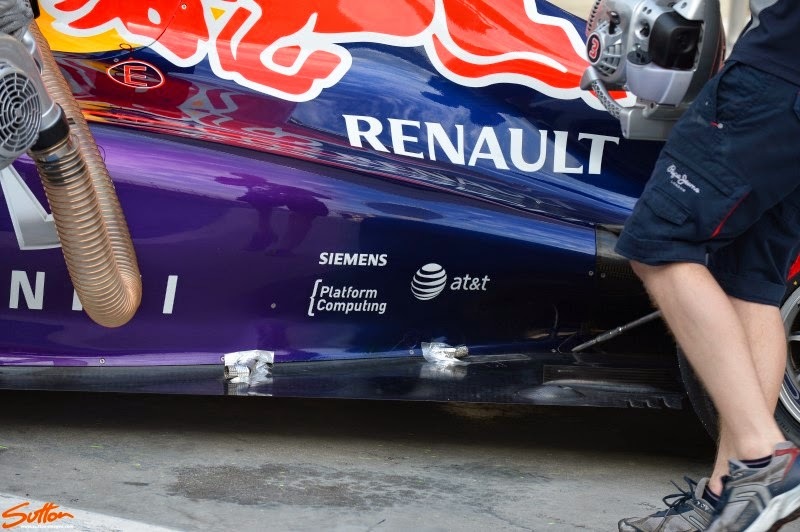 Above: Red Bull having to make some hurried alterations to their bodywork during testing due to the close proximity of the exhaust to that region of bodywork. Other issues surrounding the heatsinks used for the ERS led to a higher core temperature in the sidepods than anticipated, making this a hot spot. All the other teams but Red Bull are utilising an equal length manifold which resides aft of their engine and charge air cooling solutions. 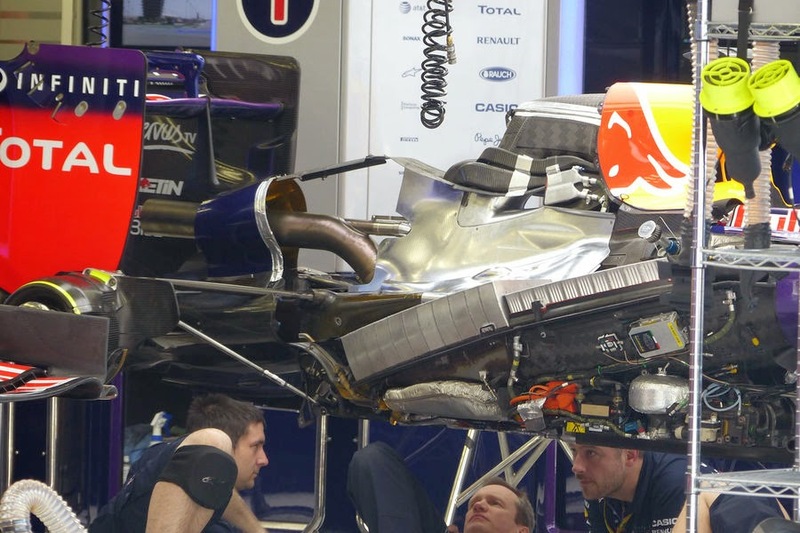 Red Bull have laid their manifold flat underneath the chargecoolers in a configuration that lends itself towards an equal length variant, however with the limited vertical space it's difficult to ascertain whether it truly is equal length and could be a hybrid of both solutions, simply extending the header lengths. 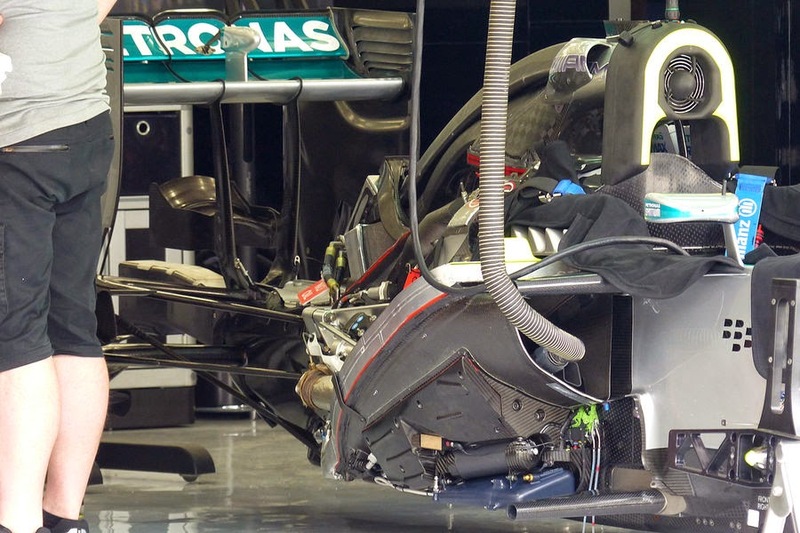 The advantage of the layout used by the Mercedes powered teams is the sheer amount of space saved by running the manifold directly to the turbine. Wastegate(s) are another component that can be selected by each team but will likely take instruction from the manufacturer in terms of their installation and operation. 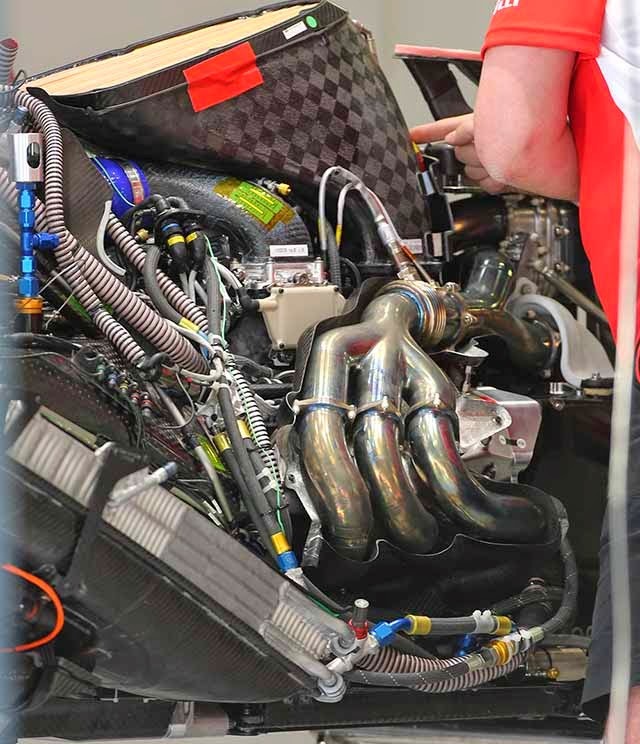 Ferrari powered teams (above) have opted to have twin wastegates (one for either manifold) as part of the Turbo/MGU-H assembly with significant pipework diameters being proportioned off. 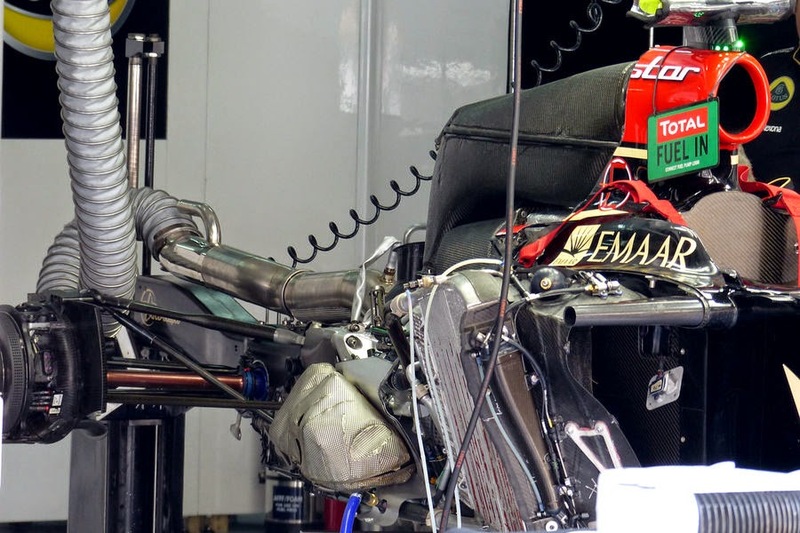 All of the other teams are using a singular wastegate with significantly smaller pipework (usually running off the centreline), whilst Lotus once again do their asymmetric thing and run only one wastegate from the left hand exhaust bank. There are some plausible (but marginal) advantages that could be extracted aerodynamically from the wastegate that I've talked about before and this might be what Lotus are trying to do with their asymmetric layout. The wastegate is an important element for the new powerunits and must be robust, several of drivers/teams have had issues with them already, probably most famously Sebastian Vettel. Their control and effectiveness is important due to the way the MGU-H operates alongside it, with a decision to be made over which one curtails the turbo based on the cars current SOC (State of Charge, ERS language for the amount of energy being recovered and sent either to the ES or directly to the MGU-K). Ferrari powered teams thus far seem to have fallen a little short of the mark with a large disparity in top end performance which was clear to see when it left Alonso a sitting duck for an attack by Hulkenberg in Bahrain. It seems their issues revolve around the way in which the two MGU's distribute power to one another and could be the result of mistakes made in selecting the size of their turbocharger. Towards the top end of the powerband it would be wise for the MGU-H to be harvesting power (ie curtailing power) and sending it directly to the MGU-K for additional power. However it seems that the Ferrari powered teams are unable to do this and instead are using energy from the ES which in turn is being depleted too rapidly, resulting in less top end horsepower. Last but no means least is a question mark over exhaust bore, you'll note from the images that all the teams have different sizes, tailored to their own performance needs. It's not an area of massive potential due to the energy leaving the exhaust being lower than in previous seasons but still worth a mention as it can be adjusted by each individual team. 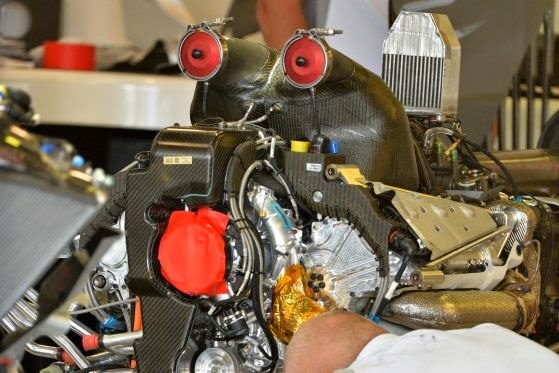 In summary the Mercedes powerunits split turbo arrangement is a performance differentiator but it's decisions that the team have made in the rest of the installation that sets them apart from even those teams that also run the Mercedes HPP unit giving them not only a power advantage but creating a more internally aerodynamic efficient car. It's quite clear to see by the behavior of the Mercedes powered cars that their ERS in it's entirety is much more mature than their counterparts, with the Renault and Ferrari powered teams struggling generally with the transition of energy under acceleration and braking. This affects the brake-by-wire system, as holes in the provision of energy or during harvesting will lead to communication issues between the MGU-H, MGU-K, ES, controller and braking system. All of these lead to a lack of feel/confidence for the drivers who then struggle to let the automation that should be going on in the background do its work. With the Renault and Ferrari powered teams having issues that really revolve around larger packaging and problems with the ERS, fixing either of these issues during the 2014 season will not only be vast and expensive but come with their own compromises. >"However it seems that the Ferrari powered teams are unable to do this and instead are using energy from the ES which in turn is being depleted too rapidly, resulting in less top end horsepower." That seems to be truth, for one Ferrari insider asserted that the reason behind the somewhat erratic pace from Alonso was caused by the early depletion of the energy store. Thanks excellent..yes i was the one that asked sky and got the sarkie comment...great read.. I read an engineering conference paper 3 years ago that calculated that the gain in power form turbo harvesting was relatively small - I think is was around 18KW - say 25 bhp but I suspect that given an F1 cars duty cycle, ie on full throttle around 60-65%, that it might be a bit higher, but then one has to make an allowance for the power absorbed by the electric motor for off throttle turbo pumping. Needless to say while 25bhp isn't much its a lot when you havent go it and it certainly seems consistent with the fuel usage that Ferrari is struggling with too. Certainly, turbo configuration is critical. It looks like Ferrari are in a whole world of trouble. For me, I think the FIA engine Homologation were too strict, far too strict given that there very little testing allowed and that which was allowed was too close together to make and major changes. But thank heaven the International court ruled in favour of the FIA. Any oter result would be unthinkable. As you say that paper was likely using road cars as a benchmark and we must remember that these turbos are top down reworking taking the MGU-H into consideration. The turbo/MGU-H is a very important aspect this season due to it's impact on how much energy can then be re-purposed by the K.
I'd have to agree on the engine Homologation being too strict and think that some scope should have been giving to changing the size of turbo's mid season etc as Ferrari clearly have theirs wrong and will suffer because of that. As for the decision by the WMSC it was the only one that could be made IMO, had they ruled against the stewards decision we would be in for anarchy this season. 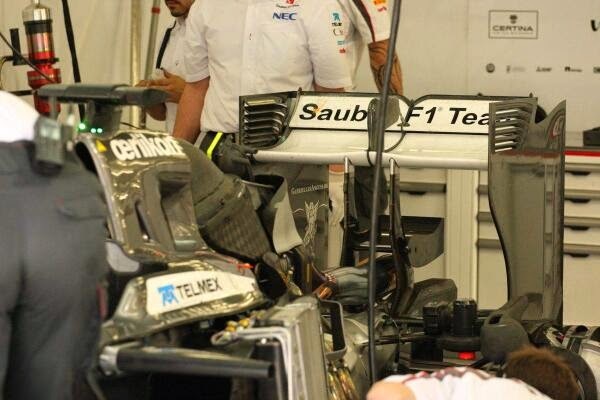 So the Mercedes powerunit of the Mercedes team is exactly the same as the other teams 'get' ? I remember in earlier years that customer engines lacked slightly in performance to the ones used by the factory team. But then of course they sometimes used older engines, wich is not possible this year. I am wondering about something the thickest loudest thing in formula one made some noise about during the commentary , the engines are all homologated but they are allowed to make changes on the grounds of either safety,reliability or costs. It also alluded to the fact that this went on all through the v8 era. Assuming this is correct information, Matt do you see any benefit for anyone chasing the Merc config, either partners or other teams. Also do you think there are any 'hidden' improvements that someone may have missed ? They are allowed to make changes on the grounds of safety/reliability as they did through the V8 era. Partly why Renault powered teams enjoyed the advantages they did when it came to exhaust blowing in the latter few seasons... However changing the specification of a turbocharger/MGU-H etc would be a leap too far in this respect with the FIA shrewd to that type of blatant equalizing measure. Only the Merc powered teams can go for an indentical configuration to Mercedes this season due to the split turbo configuration. The problem however is how much effort it would take to re-package that many components, whilst it would have a massive affect on the internal aero too. I'm not sure (by the looks of the options currently selected) that Renault have done as good a job as Mercedes in terms of the heat generated by the engine with the Renault powered teams needing additional/larger rads. This in itself is enough to stop them chasing the Merc style setup but as with everything in F1 it's viable and I could draw out a possible config if needs be with a list of components that would need to be changed. 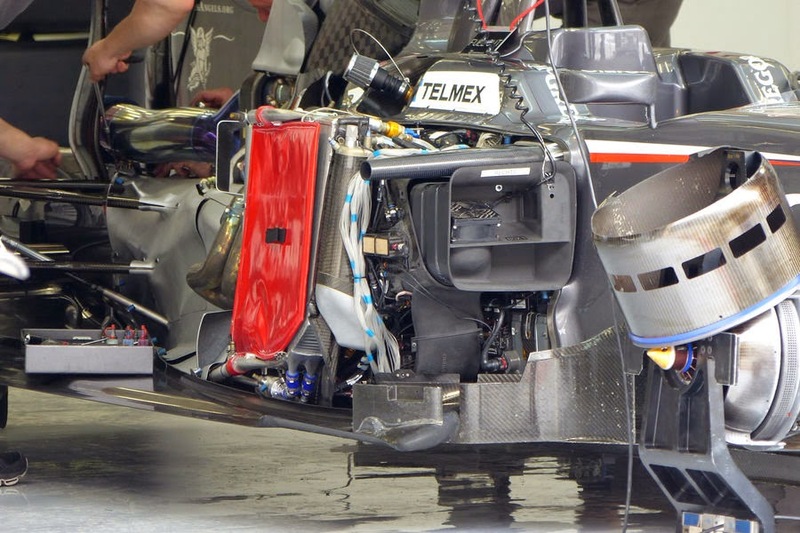 Once again this would have a massive internal/external aero impact too. Thanks Matt, I think it will be interesting as the season continues to see what changes the teams make I am a relative newcomer to your site and the background that you provide to the images is actually providing me with more incentive to stay tuned to F1 as I was off in the wilderness not watching for too long. Matt this is a non engineering question but I think a pertinent one. Sure enough, the FIA will be riding the teams on what these can or can not do to the cars but, is Ferrari ready to spend the mills they need to revamp the engine or wont the FIA allow them to do it. Ferrari is clearly pulling the strings to get some free room to develop their package but can they do it this season!? Or will they have to wait for next season to introduce a redesigned PU!? Watching Red Bulls eficient aerodinamics I'm kind of glad that Mercedes made the best PU as I'm sure that it could be a deja vu all over again with leveled PU's. Can Honda gain some advantage, now that they can see +/- how their rivals made their engines and build an engine, for example, similar to what Mercedes did with their turbo-compressor option and so on, or at this time they already have a proper plan on how to build their engine. And one more question: In 2015, the engines manufacturers will be able to change something in their engines structures, or they will have to remain as they are now? Because if so I see RB buying Mercedes engines in 2015. 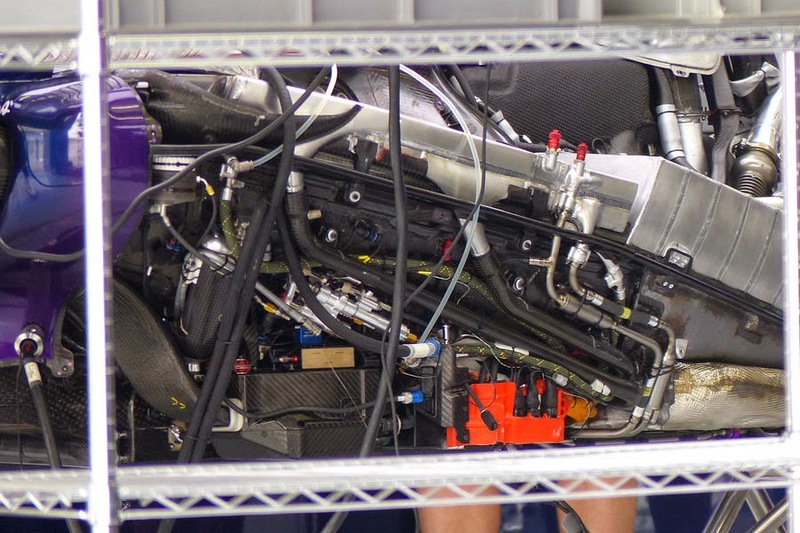 Honda will have a good idea in terms of the architecture of their powerunit but will of course take lessons from the other manufacturers in terms of layout etc whilst they're there watching proceedings. 2015 is a mass reset so the engines used this year are being used to learn from and there will undoubtedly be pretty big changes in the architecture of each PU for 2015. The rules for 2015 also allow for variable inlet lengths and so additional power/efficiency can be extracted here too. Nice, I am so thankful that you have shared this wonderful blog about root canal. My teeth cleaning services clinic loves this so much! Thx for sharing! seriously believe what advantage lies within what we cant see. i mean, look at the log style mercedes-benz unit, you would not expect that especially when combating too exhaust pressure build up that might effect combustion tempurature. i also strongly suspect they are using something really clever with that charge cool system, highly conductive liquid or maybe the its in the pumps, high powered ones. I actually appreciate this post. I've been looking all above for this! Thank goodness I found it on Bing. You have made my day! Thank you again!.